Ted Cruz asked conservatives to let their imaginations run wild. And then the junior senator from Texas explicitly asked them to imagine him as the nation’s next president. Most of the policy issues that the Texas Republican touched on—repealing “every word” of Obamacare, stopping “executive amnesty” for illegal immigrants, enacting a flat tax, abolishing the IRS, protecting religious liberty, human life and “the sacrament of marriage”—make up the red meat of a stump speech he has been honing for months. Imagine a federal government that stands for the First Amendment rights of every American! This is our fight. The answer will not come from Washington. It will come only from the men and women across this country, … from people of faith, from lovers of liberty, from people who respect the Constitution. Cruz’s announcement gives him more visibility as he seeks to break out of the back of the prospective GOP pack, currently led by Wisconsin Gov. Scott Walker and former Florida Gov. Jeb Bush, as charted by the Real Clear Politics average of early polls. 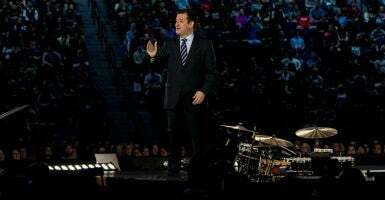 National Journal reported that Cruz appeared in Liberty’s Vines Center as part of a weekly convocation for which attendance is mandatory for some 10,000 students. Silently protesting fans of Sen. Rand Paul, R-Ky., set to announce his own candidacy April 7, sat together in their “I Stand With Rand” T-shirts as Cruz spoke. 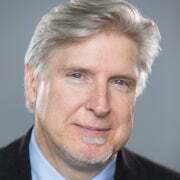 In his characteristic courtroom style, the Harvard-educated lawyer and former solicitor general of Texas was free of a podium and at ease pacing the lip of the stage in a dark suit and striped tie. What was most apparent in this speech was how often Cruz name-checked God and referred to biblical faith. Today, roughly half of born-again Christians aren’t voting. They’re staying home. Imagine instead millions of people of faith all across America coming out to the polls and voting our values. Wrapping up, Cruz drew laughter from the mostly Christian audience when he asked listeners to “break a rule” by taking out their cell phones and texting his campaign either the word “Constitution” or the word “imagine”—a move that could reap thousands of new contacts. Cruz’s wife Heidi and their two young daughters joined the newly minted presidential candidate on stage before he slowly made his way off, signing autographs along the way. This report has been modified.